For friends of the Reetz family: All gifts made to Great Peninsula Conservancy in memory of Bill Reetz will go directly to the Camp Hahobas campaign. The Reetz family has a very special connection to this land and the former Boy Scout camp. Simply add “in memory of Bill Reetz” to your check memo line or our online donation form. When the local Boy Scout council saw dwindling numbers of summer camp attendees, they decided to sell the majority of their land on the Tahuya Peninsula — the long-running Camp Hahobas — save for 120 acres to be used as a wilderness camp. And wilderness it is. 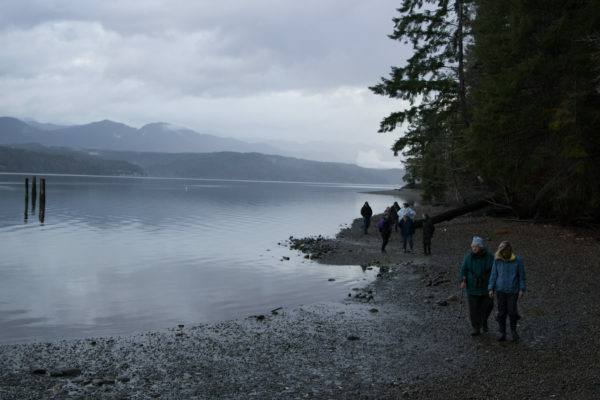 The mostly-undeveloped 550 acres in Mason County along Hood Canal feels incredibly remote. You reach the camp via a winding gravel section of North Shore Road with scattered summer cottages and towering trees. Great Peninsula Conservancy is on track to purchase 100 acres next month and 60 acres more by May/June. This unexpected opportunity came to Great Peninsula Conservancy with no time to pursue one of our most important sources of funding — state grants. With a rapidly approaching deadline, we were approved for a loan on 100 acres from a respected conservation lender and immediately turned to members to help cover the down payment and closing costs. In mere months, generous donors contributed the entire $148,000 needed to complete the first purchase. Now we are busy preparing applications for state grants to repay the loan. At the same time, we are reaching out to community members to secure funding for the remaining 60 acres: $300,000 by May 2019. 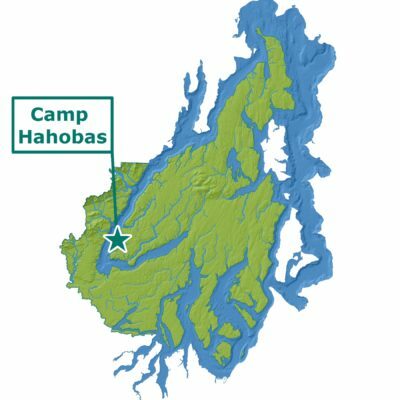 Please make a gift today to our Camp Hahobas Campaign. 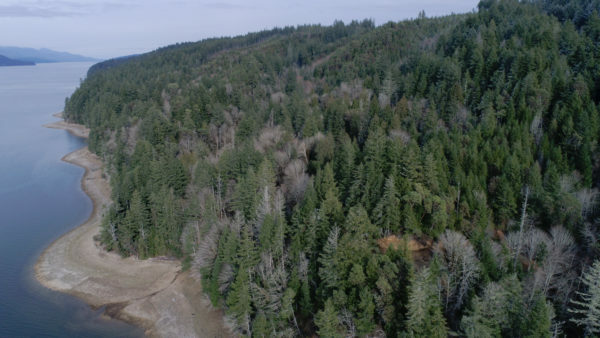 Partners in the project include the Department of Natural Resources, which will purchase the remaining 270 acres of the camp as an addition to Tahuya State Forest; the Trust for Public Land, which is brokering the deal; the U.S. Navy, which will contribute funding and hold an easement on both the GPC and DNR lands that extinguishes all development rights in perpetuity; and the Conservation Fund, another funding partner which will provide GPC with the ability to act quickly. The 160 acres to be acquired by Great Peninsula Conservancy include over one-half mile of gorgeous shoreline, native forest, and several small creeks. Preserving this special place will protect the homes of fish, shellfish, birds, and bears, while also providing an outdoor retreat for nature enthusiasts. 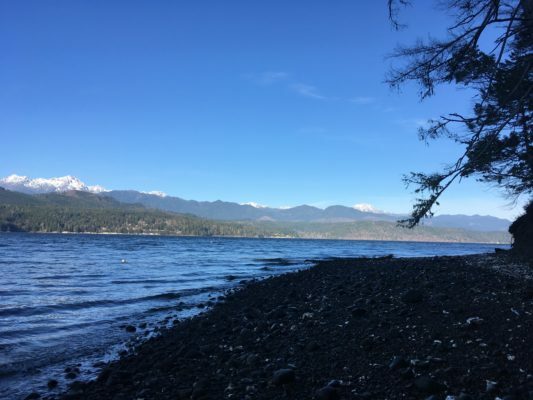 An easy hike through the forest will lead people to the magnificent beach with breathtaking views of the Olympics. Underwater gardens of eelgrass provide habitat for crab, shrimp, herring, salmon, and waterfowl. Even more than trees and other vegetation, eelgrass has an incredible capacity to absorb and store carbon. Nurturing these marine gardens is one way to protect against climate change and minimize harmful acidification of seawater. 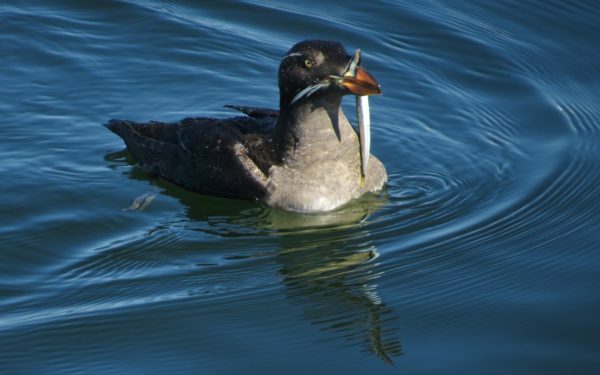 The shoreline at Camp Hahobas is a known spawning beach for surf smelt—an important little fish in the food chain that is preyed on by salmon, bald eagles, guillemots, mergansers, auklets (above), and seals among others. Eelgrass beds and smelt spawning habitat are both highly threatened by shoreline disturbance and polluted runoff. In Great Peninsula Conservancy’s ownership, this habitat-rich wilderness will forever be protected for wildlife and people!